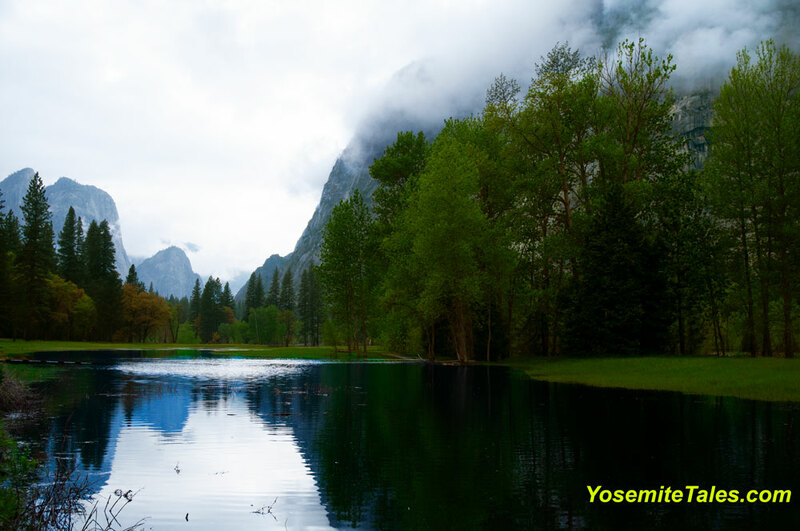 The purpose of this trip was to participate with the “Restore Hetch Hetchy” group on a hike of the north rim of Hetch Hetchy Reservoir on Sunday, May 7 (see my previous post). But I arrived Friday afternoon and wanted to spend some time with Valley and my camera. I, first, wanted to visit my old reliable photo-op haunts. On the way, of course, I saw the “flooding” of the meadows in the valley. My head was on Valley View and Tunnel View vantage points, so that’s where I was focused. My first stop was Valley View, but it was the view of Bridalveil, not the valley, that captured my attention. This shot was with the D300, 18-70 mm zoom set at 48 mm, shutter at 1/100, f16, ISO 320. The photo was taken May 5, 2017 at about 5:40 PM. I then headed for Tunnel View. This view never disappoints. Everybody and his brother have taken millions of photos from this vantage point. I, myself, have a 1-terrabyte drive with nothing but photos in and around tunnel view (not really, but I have a lot). There are only two in my collection that I would, enthusiastically, hang in a gallery. This is the second one. It’s my opinion that it is all but impossible to take a bad picture of this scene from Tunnel View. Everyone has taken or seen such photographs. I’ll bet you could go to any of the stores in the park and find at least five images of this scene in calendars, mugs, T-Shirts, puzzles, placards, or any of a number of souvenirs in which you could characterize in various forms of “Stunning”. The bench mark for this scene is what will make it an “outstanding” photo; “good” and even “stunning”, are not “outstanding.” Admittedly, this is pretty subjective and opinions vary. By “outstanding”, I mean what makes the photo Stand Out? In this case, it is the lighting (late afternoon), the contrast of the lighted cliffs vs the shadowing rocks in the close-up background, the rain clouds in the distance. I felt like I could almost smell the rain that must have just passed overhead. These are not elements over which the photographer/visitor has control. What I like about this shot is that in post-production, I could underscore what I saw and felt by adding some “emphasis” to various aspects of the photo. 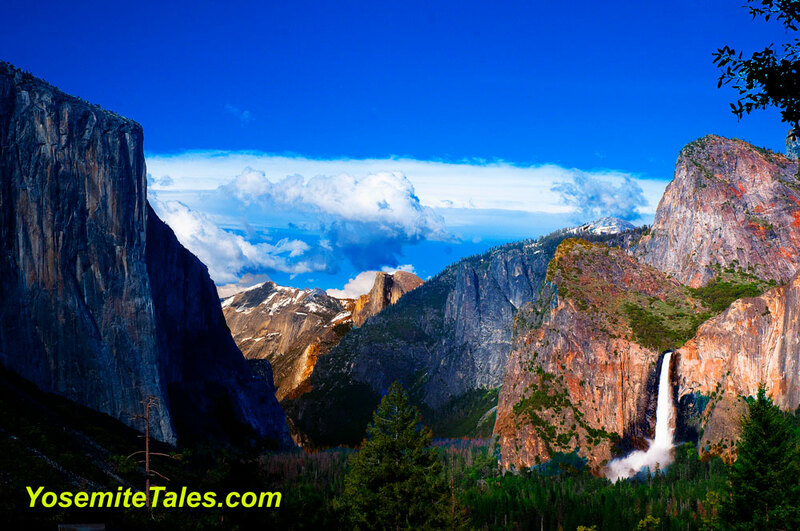 I increased the saturation of the Cathedral Rocks in the foreground and Half Dome and Clouds Rest in the background. By increasing the contrast of the overall image, I reduced the minor haze that that still hung in the air. This emphasis underscores the three dimensions of being there that is lost on a flat image. The image, itself, was taken with my D300 with the 18-70 mm at 46 mm. The shutter at 1/160, f13, and ISO at 320. This image was taken May 5, 2017 at 6:00 PM. From here, I circled back around the valley to take the pictures of the flooding. I never saw a wet valley like I did in May of 2017. I have, by no means, set the record for the number of times anyone has been to Yosemite. I am, by no means, a connoisseur of Yosemite Valley climatology. I know, by no means, all the landscapes in the valley to which one can become familiar. Nevertheless, I was stunned by what I saw. writing, these fires are still burning, though most are more than 60% contained. The Ferguson, just west of Yosemite, is now 87% contained. 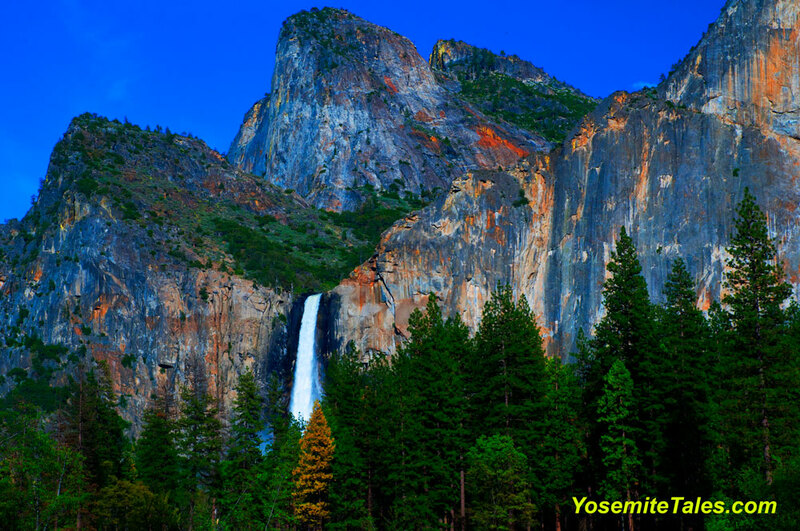 Yosemite, itself, was just reopened a few days ago (August 15, 2018) after being closed for firefighter support. The feature photo (above) was the quintessential shot of wetness. It looked like the resulting pond stretched all the way between Northside and Southside Drives. This was taken Friday evening, May 5 at 6:30 PM. I used my D300 with the 18-70 mm zoom at 18 mm. Shutter speed at 1/80, f5.6, ISO 320. The following morning, on Southside Drive (my back to the Chapel), I took this at 9:30 AM (Meadow from Southside Drive). I used the D300 with an 18-70 mm zoom set at 27 mm. Shutter speed at 1/250, f5.0, ISO 320. 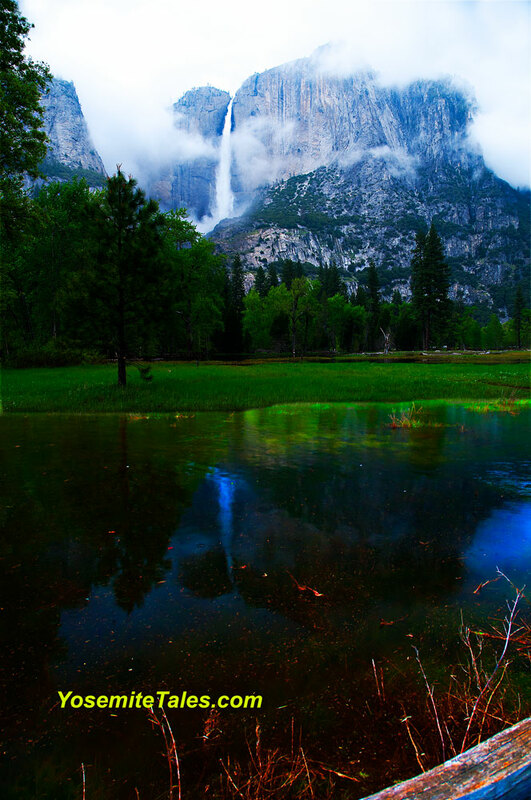 A few moments earlier, I took this one with the reflection of Yosemite Falls. This time the zoom was set to 18mm, shutter at 1/80, f5.6, ISO 320. As you can see, there was very little ability to wander the meadows. I then began photo-documentation for a future post about the Boy Scout camp Dimond-O. Saturday afternoon I did the Hetch Hetchy hike (again, see my previous post). Sunday, I died a slow and painful death as I tried to do that hike again, whimped out after about 100 feet and went home. I would return at the end of the month with “Her Majesty”.